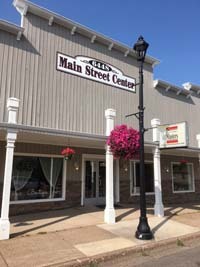 Ancona Title & Escrow (The Casterton Group) is proud to offer quality title closing and settlement services for commercial and residential real estate to the North Branch community. Improve your Home or Business! Get the Look you want! Whether you need to make a few minor changes or totally renovate your home or business, turn to Baxta Design for quality service at affordable rates. Your home or business will be looking great in no time! Baxta Design also provides the finest in home inspections, certified through InterNACHI, the International Association of Certified Home Inspectors. Cathy Carchedi is a successful Realtor with 25 years in the business. Cathy is one of the top agents in our community. She lives in the area and will be happy to help you learn all there is to know about your new community. She loves her job and will always put your interests first! Serving others as a Realtor & helping them attain their goals. Helping buyers and sellers achieve home-ownership opportunities with ease. Real Estate Business Professional, specializing in residential properties. Professional and detail oriented. Always looking out for the best interests of my clients. I truly enjoy the Real Estate Industry and helping my clients attain their goals. So whether you're buying or selling, it's your first Home, lakeshore retirement property, or Investment property, I have experience with all, and it is an absolute pleasure working with you to a successful finish! I had received my Real Estate License in 2003, however my professional career was in the Marine Industry. I was VP Sales/Marketing with Crestliner Boats at the time, and was looking at the Real Estate Business more as an encore career. I continued with Crestliner Boats and later was VP Sales/Marketing for Larson and Glastron Boats......however the Real Estate business has always drawn me to it. So several years ago, I left the Marine industry and jumped in full time in Real Estate......and absolutely love it. It is such a pleasure assisting clients navigate through the successful process of buying and selling a home. I also do enjoy being involved in our community, being a part of it and supporting it. Past involvement includes, the United Way, serving as past board member as well as president, active in the Exchange Club, a service organization, member of the Chamber of Commerce, board member of the "Wildridge" Community Association and participation in many church and local civic activities. Please feel free to contact me at anytime and again, I truly would like to assist you in all of your Real Estate plans. Let Kevin use his 20 years of experience and shop wholesale rates across 25 lenders for you and find you the perfect mortgage! If you need services or you're looking for office/business space to rent, give us a call. Real Estate has been my focus for almost 40 years now! Getting your hands dirty is the only way to really understand the depth of the business. Call me for your real estate or business space needs. From Horses to Houses, we think out of the box! Located in Main Street Center - call for an appointment. When you reach out to Bob you’re going to be in great hands with an agent that has over 24 years of real estate knowledge, experience and excellent customer service! Bob provides his clients with personal and professional representation, handling each transaction as if it were his own. Experienced in residential, new construction, commercial, investment, property management, development, land, hunting/recreational land, contract for deed and auctions. Comprehensive experience in land development working with local municipalities and governmental entities. Licensed to sell property anywhere in the state of Minnesota. Locally owned and operated, full-service closing and title agency. As a premier real estate agent, I’m here to provide you with all the resources and information you need to buy or sell real estate. I work with buyers and sellers in Forest Lake, Saint Francis, Cambridge, North Branch, Harris and the surrounding areas and I’ve had extensive training in the latest real estate marketing strategies. I’m confident that I can offer you knowledge and tools most other agents can’t. Affordable, independent senior housing in the heart of downtown North Branch. Real Estate Agent - honest, ethical, loyal, professional and local. © 2018 North Branch Area Chamber of Commerce. All Rights Reserved.